New York, SANA-Deputy Prime Minister, Foreign and Expatriates Minister Walid al-Moallem delivered a keynote speech at the 70th UN General Assembly in New York. In his speech, al-Moallem said the Syrian Arab army is capable of matching words with actions in the fight against terrorism, calling for stemming the flow of terrorists coming to Syria and taking a firm line against the countries supporting them. 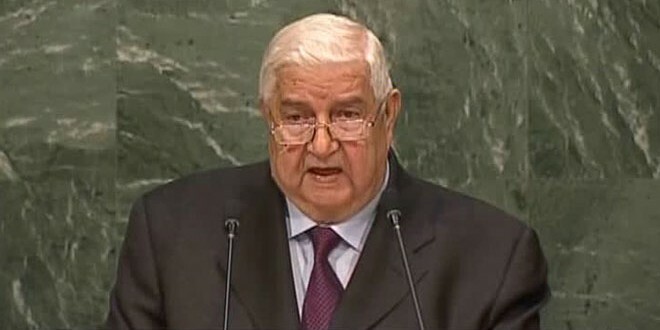 “I am coming from a country where security had been shaken and peace is gone…a country in the grip of a fierce war that has been on for four years, expecting this international organization to deliver on its promises and enforce its counter-terrorism resolutions,” al-Moallem said in an impassioned address to the session. 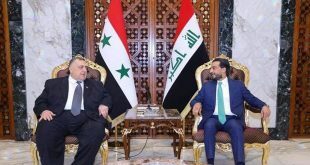 He said the UN resolutions under Chapter VII remain “ink on paper” mentioned only in press releases and media statements amid continued support provided by some countries to terrorists in a way that feeds extremism in the region. 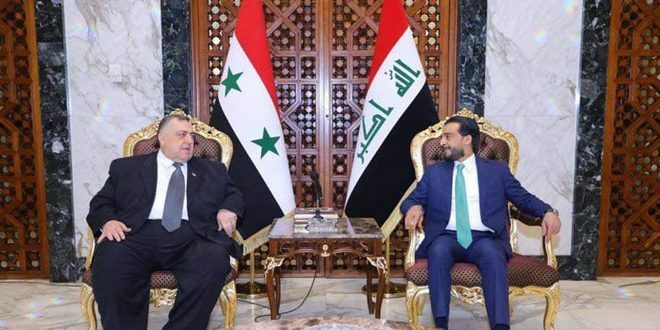 Al-Moallem criticized the “utter silence” vis-à-vis sustained support provided to terrorists in Syria by countries that make a mockery of the UN resolutions while the countries committed to the international law are “bullied”. 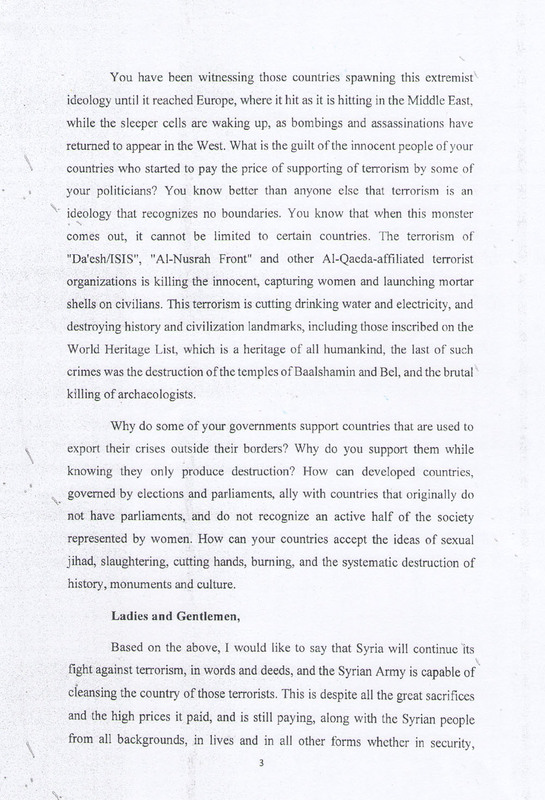 He issued a blistering criticism against Western countries which had remained silent as terrorism was striking the Middle East until it hit home.”You had been witnessing these countries spawning extremist thought until it reached European states…. 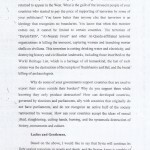 bombings and assassinations are now back in the West,” saying that terrorism cannot be confined to a geographical spot. 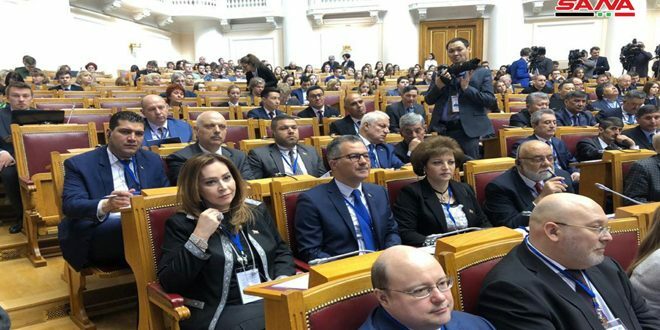 The minister pointed out the paradox in democratic Western countries forging alliances with countries that have no parliaments and treat women as inferiors. 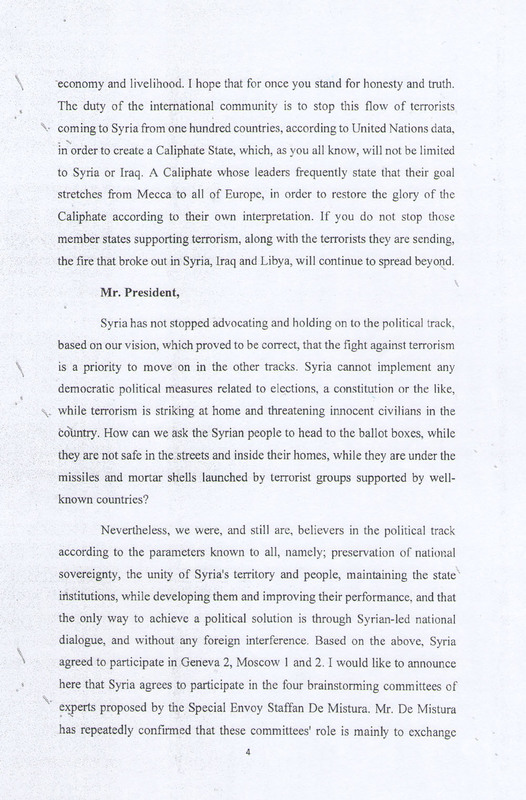 Based on the above facts, al-Moallem vowed that Syria will continue to fight terrorism until cleansing the Syrian lands of terrorists at all costs, urging the international community to “stand for honesty and truth” by stopping the flow of terrorists coming from a hundred countries to establish an Islamic Caliphate. Al-Moallem defended Syria’s firm commitment to the “political track” but considered fighting terrorism a more urgent priority. “How can we ask the Syrian people to go to the ballot boxes when they are not safe in their houses and streets…when shells fired by terrorist organizations are raining down?,” he wondered. 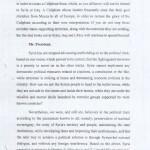 This, he added, had not shaken Syria’s belief in the political track according to parameters know to all: primarily the preservation Syria’s sovereignty, unity, territorial integrity and state institutions, reiterating that the only way for a political solution is a Syrian-Syrian dialogue away from foreign intervention. “Based on this, Syria agreed to take part in Geneva 2 and Moscow 1-2,” he said. 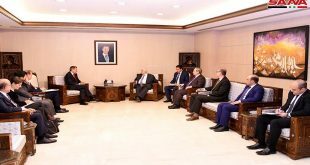 Al-Moallem announced that Syria agrees to participate in the four brainstorming committees of experts proposed by UN Special envoy Staffan De Mistura whose role he said is mainly to exchange ideas and conduct unbinding preliminary consultations whose agreed-upon outputs can be used to prepare for the launching of Geneva 3. He said Russia’s decision to start bombing targets was based on the Syrian government’s request and is effective because it supports Syria’s efforts to combat terrorism. “Airstrikes are useless unless they are conducted in cooperation with the Syrian Arab army, the only force in Syria that is combating terrorism,” he maintained. He added that the so-called “Arab Spring” has paid considerable dividends for Israel and its undercover and known allies, citing Israeli treatment of wounded terrorists in its hospitals as a sign of tangible support. Israel has repeatedly targeted sites inside Syria and is doing so to shore up terrorists whenever weakened, he added, which is similar to what Turkey is doing in Aleppo and Idleb. 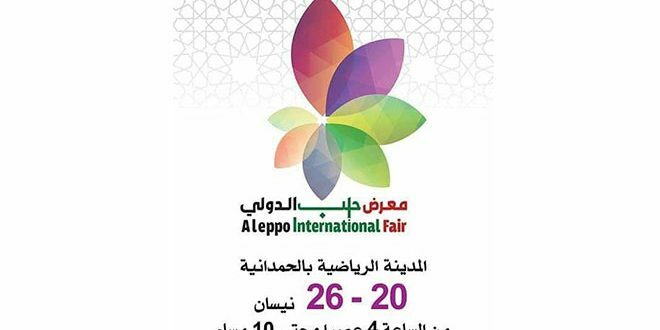 Saudi Arabia and Qatar are doing the same using their tools, al-Moallem added. 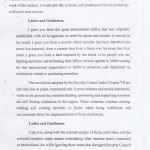 Referring to European sanctions against the Syrian people, al-Moallem said they have exacerbated the living conditions of Syrian civilians at a time when the Syrian government is pulling out at all stops to meet the basic needs of citizens in cooperation with the United Nations and its humanitarian bodies. He said the Syrian state guarantees the safe return and decent life for the citizens who are willing to return, vowing that humanitarian efforts will continue apace to deliver aid to all Syrian citizens. 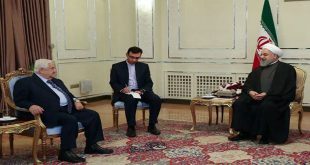 Reiterating Syria’s full adherence to the restoration of the occupied Golan, al-Moallem said it emphasizes rejection of all actions taken by Israel, the occupying power, to change its natural, geographic and demographic characteristics. 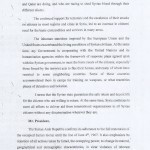 Syria confirms, also, that the Palestinian issues continues to occupy a center stage for the Syrian people, he said, reaffirming full support for the rights of the Palestinian people, particularly the right of return and self determination, and the establishment of its independent state with Jerusalem as its capital. 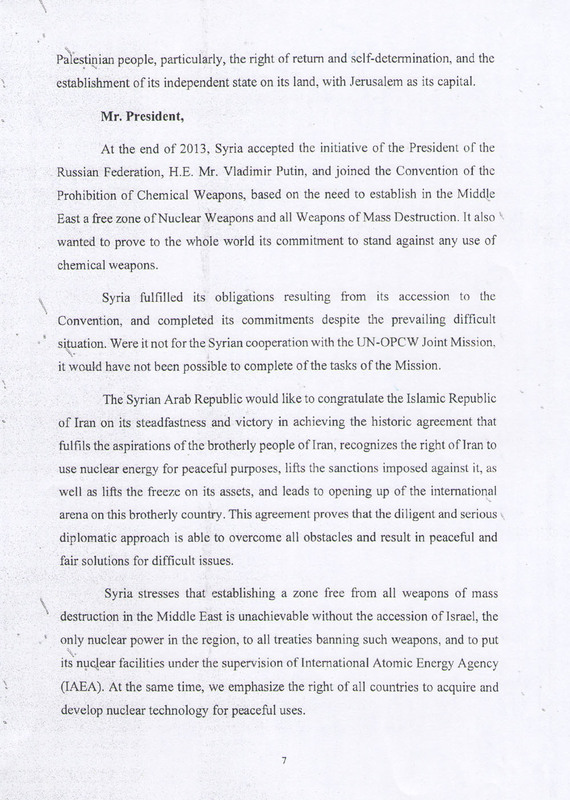 Al-Moallem called to mind Syria’s accession to the Convention of the Prohibition of Chemical Weapons based on its awareness of the need to establish WMD-free Middle East, leaving no doubt as to its opposition to the use of chemical weapons. 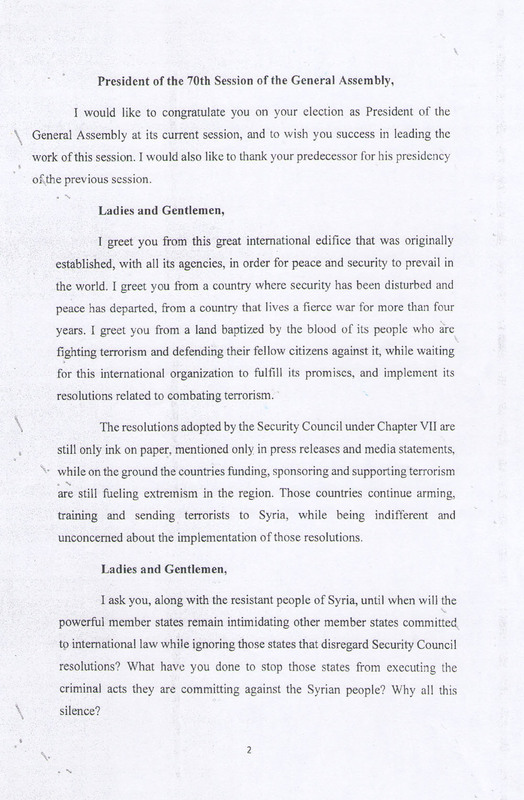 Syria honored the commitments resultant from its joining the treaty against tough odds, he added. 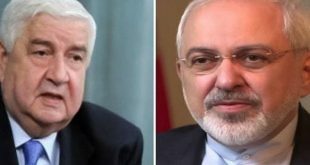 Al-Moallem seized the opportunity to congratulate the Islamic Republic of Iran which clinched a “historic nuclear deal” that endorsed Iran’s right to a peaceful use of nuclear energy. 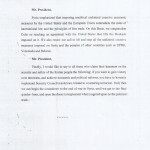 “This agreement proves that the diligent and serious diplomatic approach is able to overcome all obstacles,” he said. 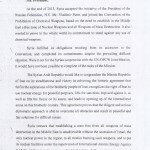 He indicated that establishing a zone free of all weapons of mass destruction in the Middle East is unconceivable without the accession of Israel, the only nuclear power in the region, to all treaties banning such weapons, calling for putting Israel’s nuclear facilities under the supervision of the international Atomic Energy Agency. 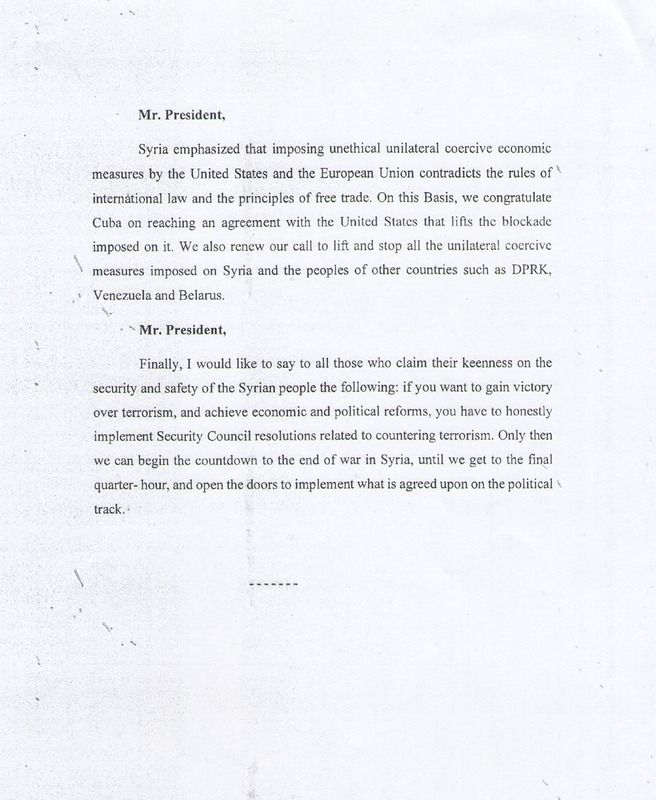 Al-Moallem congratulated Cuba for reaching an agreement with the United States that lifts the blockade imposed on it, renewing call to lift and stop all unilateral coercive measures imposed on Syria and the peoples of other countries such as DPRK, Venezuela and Belarus.